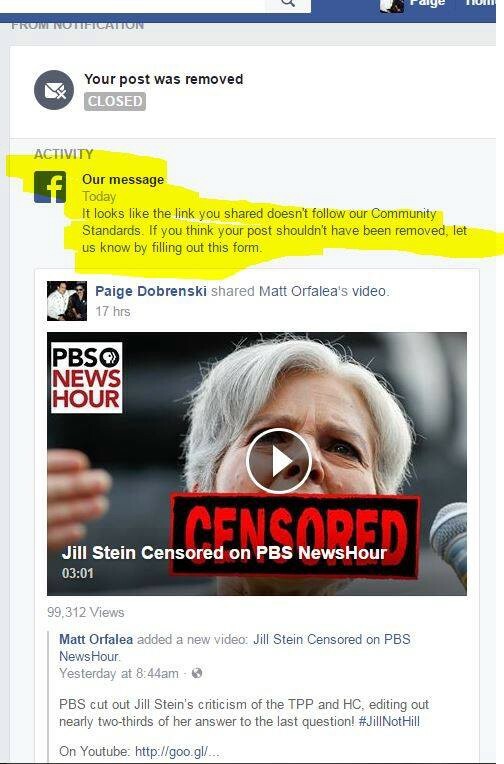 I called out PBS for censoring Jill Stein. And now I have been censored by Facebook. 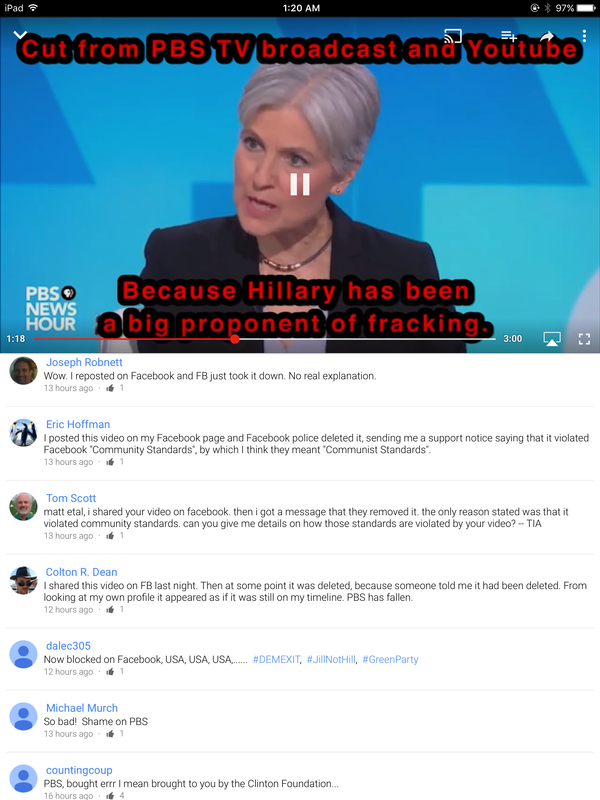 The video (still on Youtube) reveals PBS selectively editing out nearly two-thirds of Jill’s response to the last interview question. The Facebook video got more than 5k shares and 100k views and in less than 24 hrs. And then all of a sudden, this afternoon, it disappeared. I received no notification from Facebook about it. 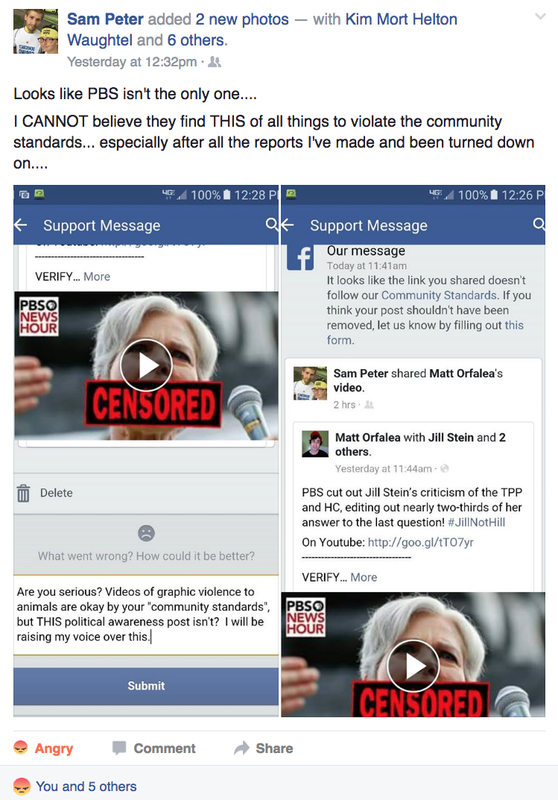 The thousands of posts sharing the video are now invisible to the public. 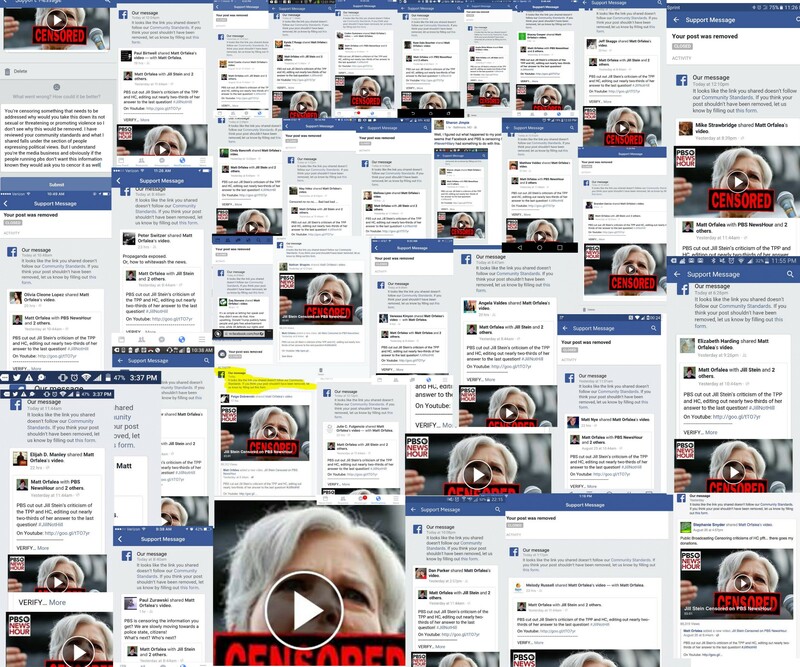 Just a handful of the screenshots shared all over Facebook. This is wrong. And frankly, very scary. 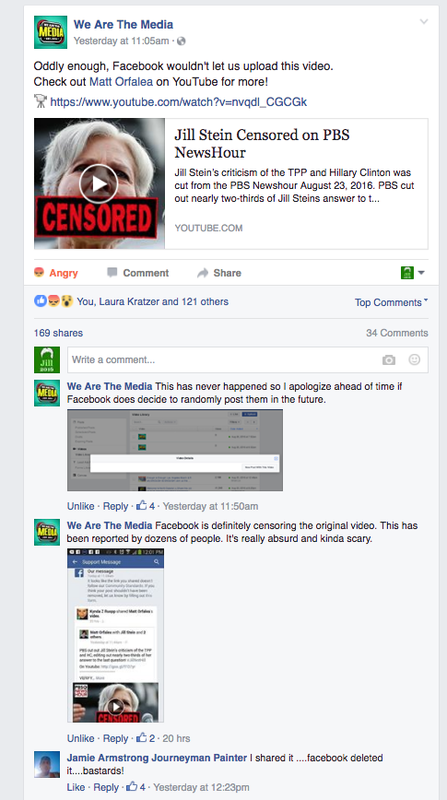 The comment sections of several posts are filled with people sharing screenshots documenting the removal of the video from their timelines. Many commenters on Youtube also say their posts of the video on Facebook were removed. The video has since been re-uploaded to other pages, including my own personal profile (separate from my Page where it’s still hidden). But Facebook really hindered the momentum the original was generating by removing it. I’m shocked, disturbed,…and FURIOUS. 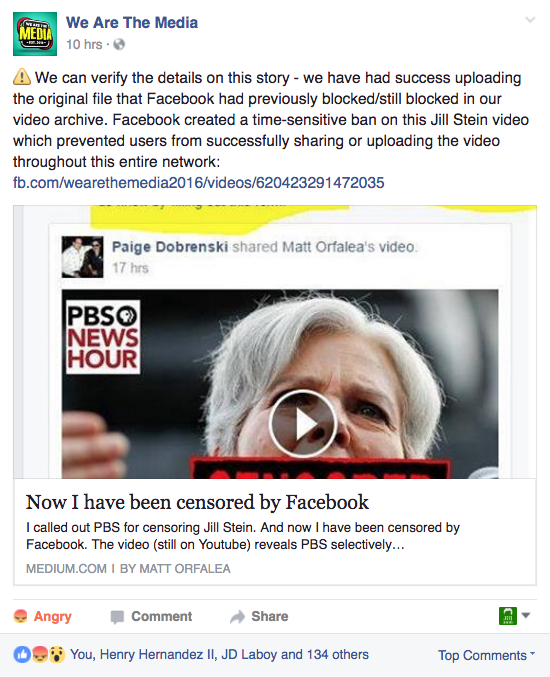 Please share this and remind the TV and Internet censors of the “Streisand effect”. Update 8/27/16: Not everybody got the “Community Standards” notification. 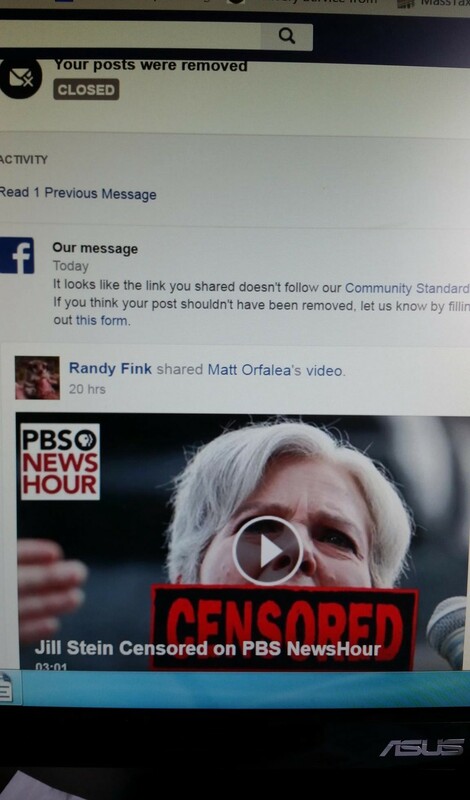 *Update 8/28/16: The original video is still blocked on my Facebook Page. But new uploads to my Page are not. Update 8/28/16: I previously posted on Facebook that I was unable to tag my Page in posts, I tested that with other Pages, and it seems that is normal. 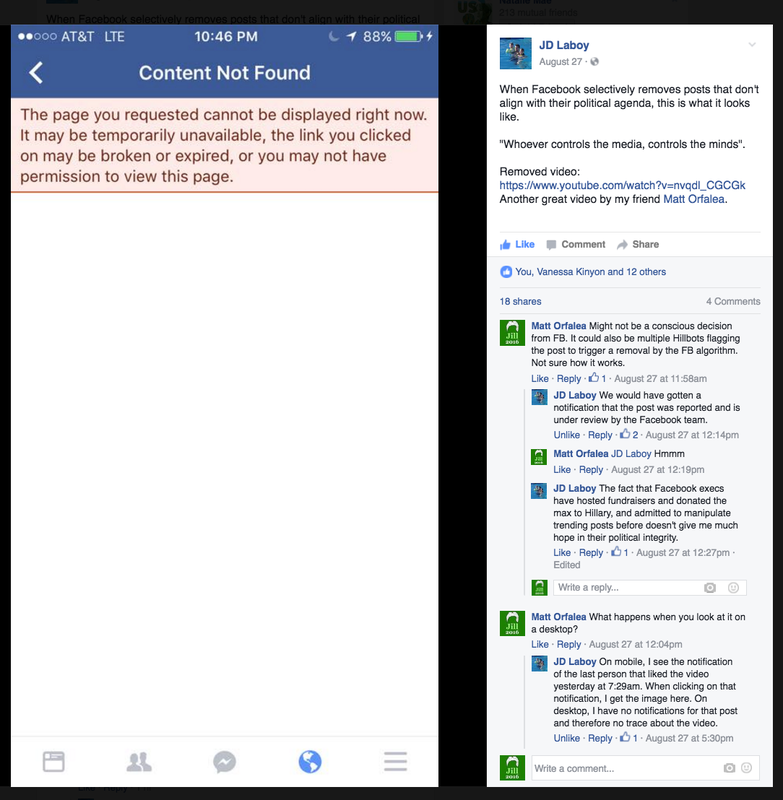 You cannot tag Facebook Pages in posts, only pics and videos. This is different from personal Facebook profiles, which can be tagged in posts (in addition to pics and videos). This resource was created thanks to a crowdfunded monthly basic income. If you find value in this article, you can support it along with all my future work with a monthly patron pledge of $1+. Democrips and Rebloods are just Corporate thugs.